Chronic subdural haematoma is predominantly a disease of the elderly. It usually follows a minor trauma. A history of direct trauma to the head is absent in up to half the cases. The common manifestations are altered mental state and focal neurological deficit. Neurological state at the time of diagnosis is the most important prognostic factor. Morbidity and mortality is higher in the elderly but outcome is good in patients who undergo neurosurgical intervention. Chronic subdural haematoma (CSDH) is an encapsulated collection of old blood, mostly or totally liquefied and located between the dura mater and arachnoid. It was first described by Virchow in 1857 as “pachymeningitis haemorrhagica interna”. Later Trotter put forward the theory of trauma to the bridging veins as a cause of what he named “subdural haemorrhagic cyst”. Since then trauma has been recognised as an important factor in the development of CSDH. CSDH should be differentiated from acute subdural haematoma. Acute subdural haematomas generally occur in younger adults, after a major trauma, often associated with structural brain injury, and present within 72 hours. In contrast, CSDHs often occur in the elderly after a trivial injury without any damage to the underlying brain and usually there is a period of weeks to months before it becomes clinically evident. It has a peak incidence in the sixth and seventh decade of life. Fogelholm and Waltimo estimated an incidence of 1.72/100 000 per year, the incidence increasing steeply with advancing age up to 7.35/100 000 per year in the age group 70–79.1 This incidence is expected to rise further due to the continuing growth of the older population. Trauma is an important factor in the development of CSDH. However, a history of head injury (direct trauma) is absent in about 30%–50% of the cases. Indirect trauma seems to be more important. About half the patients have a history of fall but without hitting their head on the ground.4,5 In many situations the trauma is so trivial that it is forgotten. Other predisposing factors include anticoagulation, alcoholism, epilepsy, bleeding diathesis, low intracranial pressure secondary to dehydration or after the removal of cerebrospinal fluid, and receiving renal dialysis, presumably due to platelet dysfunction.3 As many as 24% of patients with CSDH are on warfarin or an antiplatelet drug6; 5%–10% have a history of alcoholism and epilepsy. The initial trauma to the bridging veins results in haemorrhage in to the subdural space. A day after the haemorrhage, the outer surface of the haematoma is covered by a thin layer of fibrin and fibroblasts. Migration and proliferation of the fibroblasts leads to formation of a membrane over the clot by the fourth day. The outer membrane progressively enlarges and the fibroblasts invade the haematoma and form a thin membrane during the next two weeks.7 Liquefaction of the haematoma occurs due to the presence of phagocytes. Then the haematoma may either resorb spontaneously or slowly increase in size resulting in a CSDH. The incidence of headache varies in different studies ranging from 14% to 80%.6,17 It is less common in the elderly when compared with a younger patient.17 It is partly due to the large available intracranial space for the haematoma to accommodate before creating pressure on the adjacent brain. Another reason is the earlier onset of confusion, which attracts medical attention before the development of headache in the elderly. Interestingly falls have been reported to be a very common presenting symptom (74%) in a recent prospective study involving 43 elderly patients.6 It is a well known fact that recurrent fall is a significant risk factor for CSDH. Development of CSDH may lead to recurrent falls or increase the frequency of falls due altered mental state, neurological deficits, and postural disturbances. Epilepsy is traditionally thought to be a rare presentation, even though it has been reported in up to 6% of cases as an initial symptom.13 In patients with known epilepsy increasing frequency of seizures has been noted with the development of CSDH. Simple partial seizure has been reported as a sole manifestation of CSDH, and this could be easily mistaken for a transient ischaemic attack.18 Seizures usually occur in the presence of a large haematoma associated with focal neurological deficit. Patients presenting with vertigo and nystagmus, upward gaze palsy, and isolated oculomotor palsy due to CSDH have been reported.23–25 Increased intracranial pressure causing uncal herniation and stretching of cranial nerves was thought to be the mechanism involved. CSDH causing parkinsonian symptoms is a well recognised phenomenon.26 In a review of 20 cases the haematoma was found to be bilateral in nine and marked improvements were seen in most patients after surgical drainage. Reversible akinetic-rigid syndrome due to bilateral CSDH with complete resolution after surgery has also been reported.27 The mechanisms suggested are pressure on the basal ganglia, compression of midbrain, and circulatory disturbances in the basal ganglia caused by displacement and compression of anterior choroidal artery. Gerstmann's syndrome (right-left disorientation, finger agnosia, agraphia, and acalculia) and progressive quadriparesis due to CSDH has been reported in the literature.28,29 These patients made a good recovery after the evacuation of haematoma. The diagnosis of a CSDH is not usually suspected at the time of initial presentation in majority of cases. In a series of 194 cases (in 1979), CSDH was suspected only in 28% of patients.13 Other suspected diagnoses at the time of presentation include tumour (27%), subarachnoid haemorrhage (10%), and cerebrovascular accident (6%). However in our recent study involving 40 patients (unpublished data), cerebrovascular accident was the most common initial diagnosis (48%) followed by CSDH (20%) and others including tumour (32%). The most important step in the diagnosis of CSDH is a high index of suspicion. It should be considered in any patient with or without a history of trauma presenting with (1) a change in mental status or worsening of pre-existent neurological or psychological illness, (2) focal neurological deficit, and (3) headache with or without focal neurological deficit. Computed tomography of the brain should be strongly considered in these patients to exclude a CSDH. Computed tomogram without contrast showing large right CSDH extending from the frontal lobe to the parietal lobe with blood in the lateral ventricles. There is mass effect with effacement of the sulci, compression of the cerebral hemisphere and midline shift to the left. Computed tomogram with contrast reveals recent haemorrhage giving a non-homogenous appearance of CSDH in the same patient. However magnetic resonance imaging (MRI) scan may be required in patients with isodense haematoma without midline shift and in identifying small collections at the vertex, base of the skull and in the posterior fossa.34–36 It has been clearly shown that MRI is better than computed tomography in identifying small and transversely oriented collections where the computed tomogram has failed to identify a collection in as much as 80% of cases.37 Even though some of these lesions may not need surgical intervention, they have significant therapeutic implications such as prevention of anticoagulation in these patients. Even though MRI has advantages, computed tomography remains the procedure of choice in the acute setting because of shorter examination time, which is important in acutely ill patients, reliability in identifying other parenchymal lesions, no magnetic interference (especially in patients on life support machines) and the ready availability. Treatment of CSDH is by surgical evacuation, although small haematomas may resolve spontaneously.38 A recent study has shown that 23% of the patients did not warrant surgery because the haematoma was small.6 Patients treated conservatively should be carefully monitored and the scan should be repeated if there is a clinical deterioration. Some studies have shown that concurrent use of high dose steroids accelerate the resolution of subdural collection.39 But these studies were done in 1970s involving small number of patients and there is no strong evidence to advocate the routine use of steroids in CSDH. Worsening of pre-existent neurological/psychological illness. The commonly followed surgical procedures include drainage by twist drill/burr hole craniostomy or craniotomy. Twist drill trephination was associated with lower mortality rate, reoperation rate, and duration of inpatient stay compared with burr hole craniostomy.40 Craniotomy is usually reserved for those patients in whom there is reaccumulation with recurrence of symptoms or where there is a solid haematoma. The following complications are encountered in addition to the usual postoperative problems such as infection and inappropriate secretion of antidiuretic hormone. Reaccumulation of the haematoma is the most common postoperative problem. Residual fluid can be detected on computed tomography in as many as 80% of the patients, a majority of them asymptomatic and clinically insignificant. Symptomatic recurrence has been noted in 8%–37% of postoperative patients.3 It usually occurs between four days to four weeks with an average interval of 12 days. Clinical deterioration with radiological evidence brings attention to this condition. It is more common in the elderly and inadequate expansion of the brain following the evacuation of the haematoma is thought to play a part. Development of tension pneumocephalus after burr hole evacuation of CSDH is a rare postoperative complication. The chronically compressed brain is thought to contribute to the ingression of intracranial air. The slow re-expansion of the brain and trapped subdural air leads to increase in intracranial pressure leading to neurological deterioration. This complication has been reported in as many as 8% of patients after surgical intervention.43 Craniostomy and aspiration is the usual treatment. The morbidity and mortality in CSDH varies widely in the literature. The overall in-hospital mortality during index admission was found to be 15.6% for patients with CSDH in a large series involving 157 patients.5 However the outcome is good in patients who undergo neurosurgical intervention where the morbidity and mortality after surgery is around 16% and 6.5% respectively.44 The significant difference is due to the fact that critically ill patients are not considered fit for surgery resulting in a higher overall mortality. Jones S, Kafetz K. A prospective study of chronic subdural haematomas in elderly patients. Age Ageing1999;28:519–21. Rozzelle CJ, Wofford JL, Branch CL. Predictors of hospital mortality in older patients with subdural haematoma. J Am Geriatr Soc1995;43:240–4. Traynelis VC. Chronic subdural haematoma in the elderly. Clin Geriatr Med1991;7:583–98. Luxon LM, Harrison MJG. Chronic subdural haematoma. Q J Med1979;189:43–53. Cameron MM. Chronic subdural haematoma: a review of 114 cases. J Neurol Neurosurg Psychiatry1978;41:834–9. In a recent prospective study of 43 patients, only 16 (37%) were able to undergo surgical intervention, four were too ill, and one died soon after the scan. The rest of the patients were treated conservatively for either the haematoma was small (10 patients) or for other reasons not clearly identified in the study.6 Six month mortality was 31% (13 patients) of which only one death occurred in the operated group. In patients who died, CSDH was the direct cause of death in half and the rest were due to underlying disease. Occurs after a trivial injury. Associated with brain contusion and damage. Mechanism involves trauma to the bridging veins. Clinical picture at the time of diagnosis. 1. (A) T, (B) F, (C) T, (D) T; 2. (A) T, (B) F, (C) F, (D) T; 3. (A) F, (B) T, (C) T, (D) T; 4. (A) T, (B) T, (C) T, (D) F; 5. (A) T, (B) T, (C) T, (D) T; 6. (A) T, (B) T, (C) T, (D) F.
Fogelholm R, Waltimo O. Epidemiology of chronic subdural haematoma. Acta Neurochir1975;32:247–50. Ellis GL. Subdural haematoma in the elderly. Emerg Med Clin North Am1990;8:281–94. Feldman RG, Pincus JH, McEntee WJ. Cerebrovascular accident or subdural fluid collection? Arch Intern Med1963;112:966–76. Munro D, Merritt HH. Surgical pathology of subdural haematoma: based on a study of one hundred and five cases. Arch Neurol Psych1936;35:64–78. Gardner WJ. Traumatic subdural haematoma with particular reference to the latent interval. Arch Neurol Psych1932;27:847–58. Weir B. The osmolality of subdural haematoma fluid. J Neurosurg1971;34:528–33. Sato S, Suzuki J. Ultrastructural observations of the capsule of chronic subdural haematoma in various clinical stages. J Neurosurg1975;43:569–78. Ito H, Yamamoto S, Saito K, et al. Quantitative estimation of haemorrhage in chronic subdural haematoma using the 51Cr erythrocyte labeling method. J Neurosurg1987;66:862–64. Potter JF, Fruin AH. Chronic subdural haematoma—“the great imitator”. Geriatrics1977;32:61–6. Henderson MJ. A difficult psychiatric patient. Postgrad Med J2000;76:585, 590–1. Cole G. Intracranial space occupying lesions in mental hospital patients: necropsy study. J Neurol Neurosurg Psychiatry1978;41:730–6. Fogelholm R, Heiskanen O, Waltimo O. Chronic subdural haematoma in adults; influence of patient's age on symptoms, signs, and thickness of hematoma. J Neurosurg1975;42:43–6. Hilt DC, Alexander GE. Jacksonian somatosensory seizures as the sole manifestation of chronic subdural hematoma. Arch Neurol1982;39:786. Moster ML, Johnston DE, Reinmuth OM. Chronic subdural haematoma with transient neurologic deficits: a review of 15 cases. Ann Neurol1983;14:539–42. Schaller B, Radziwill AJ, Wasner M, et al. Intermittent paraparesis as manifestation of chronic subdural haematoma [German]. Schweiz Med Wochenschr1999;129:1067–72. Melamed E, Lavy S, Reches A, et al. Chronic subdural hematoma simulating transient cerebral ischemic attacks. J Neurosurg1975;42:101–3. Welsh JE, Tyson GW, Winn HR, et al. Chronic subdural hematoma presenting as transient neurologic deficits. Stroke1979;10:564–7. Ashkenazi E, Pomeranz S. Nystagmus as the presentation of tentorial incisure subdural haematoma. J Neurol Neurosurg Psychiatry1994;57:830–1. Phookan G, Cameron M. Bilateral chronic subdural haematoma: an unusual presentation with isolated oculomotor nerve palsy (letter). J Neurol Neurosurg Psychiatry1994;57:1146. Sandyk R. Isolated failure of upward gaze as a sign of chronic subdural haematoma (letter). S Afr Med J1982;61:32. Sunada I, Inoue T, Tamura K, et al. Parkinsonism due to chronic subdural haematoma. Neurol Med Chir (Tokyo)1996;36:99–101. Abdulla AJJ, Pearce VR. Reversible akinetic-rigid syndrome due to bilateral subdural haematomas (letter). Age Ageing1999;28:582–3. Maeshima S, Okumura Y, Nakai K, et al. 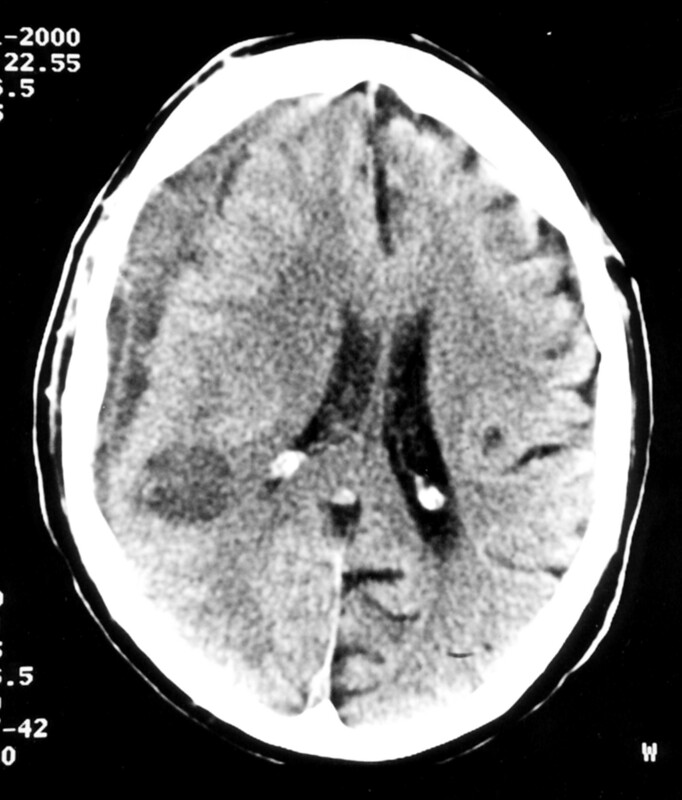 Gerstmann's syndrome associated with chronic subdural haematoma. Brain Inj1998;12:697–701. Lesoin F, Destee A, Jomin M, et al. Quadriparesis as an unusual manifestation of chronic subdural haematoma. J Neurol Neurosurg Psychiatry1983;46:783–5. Wali GM. “Ease of falling” syndrome associated with subdural haematoma (letter). J Neurol Neurosurg Psychiatry1994;57:1144–5. Lee K, Bae W, Bae H, et al. The computed tomographic attenuation and the age of subdural haematomas. J Korean Med Sci1997;12:353–9. Karasawa H, Tomita S, Suzuki S. Chronic subdural haematomas: time density curve and iodine concentrations in enhanced CT. Neuroradiology1987;29:36–9. Kim KS, Hemmati M, Weinberg P. Computed tomography in isodense subdural haematoma. Radiology1978;128:71–4. Hosoda K, Tamaki N, Masumura M, et al. Magnetic resonance images of chronic subdural hematoma. J Neurosurg1987;67:677–83. Snow RB, Zimmerman RD, Gandy SE, et al. Comparison of magnetic resonance imaging and computed tomography in the evaluation of head injury. Neurosurgery1986;18:45–52. Han J, Kaufman B, Alfidi RJ, et al. Head trauma evaluated by magnetic resonance and computed tomography: a comparison. Radiology1984;150:71–7. Kelly AB, Zimmerman RD, Snow RB, et al. Head trauma: comparison of MR and CT experience in 100 patients. Am J Neuroradiol1988;9:699–708. Naganuma H, Fukamachi A, Kawakami M, et al. Spontaneous resolution of chronic subdural hematomas. Neurosurgery1986;19:794–8. Bender MB, Christoff N. Nonsurgical treatment of subdural hematomas. Arch Neurol1974;31:73–9. Smely C, Madlinger A, Scheremet R. Chronic subdural haematoma—a comparison between two different treatment modalities. Acta Neurochir (Wien)1997;139:818–26. Reinges MHT, Hasselberg I, Rhode V, et al. Prospective analysis of bedside percutaneous tapping for the treatment of chronic subdural haematoma in adults. J Neurol Neurosurg Psychiatry2000;69:40–7. Maurice-Williams RS. Bedside treatment of chronic subdural haematoma? Lancet2001;357:1308–9. Sharma BS, Tewari MK, Khosla VK, et al. 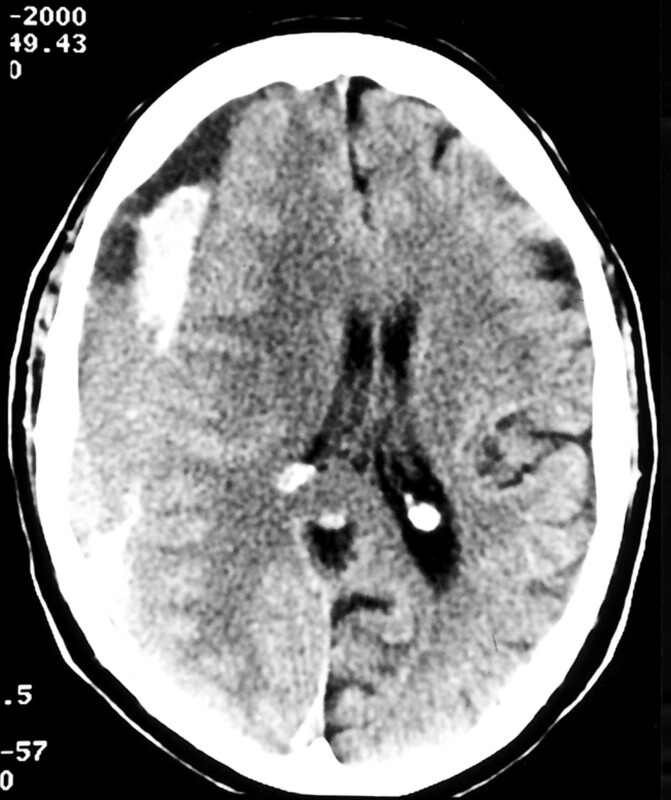 Tension pneumocephalus following evacuation chronic subdural haematoma. Br J Neurosurg1989;3:381–7. Van Havenberg T, van Calenbergh F, Goffin J, et al. Outcome of chronic subdural haematoma: analysis of prognostic factors. Br J Neurosurg1996;10:35–9.